(SOUNDBITE) (English) U.S. SENATOR KAMALA HARRIS VIA TWITTER, SAYING: "That's why I'm running for president of the United States. I'm running to lift those voices." 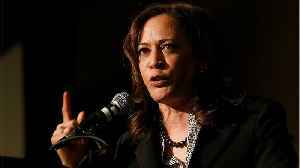 U.S. Democratic Senator Kamala Harris on Monday declared she would seek her party's presidential nomination. (SOUNDBITE) (English) U.S. SENATOR KAMALA HARRIS, SAYING (NOV.
Those people who win get to write the rules." 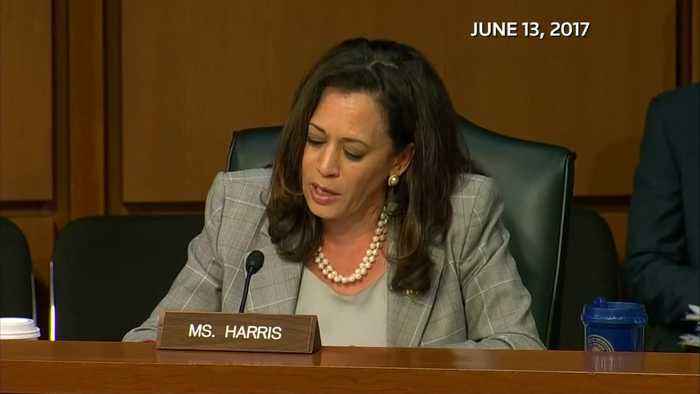 Harris is still in her first term as California's junior senator. 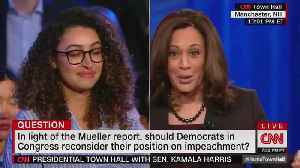 She rose in the public eye for her grilling of Trump cabinet members... (SOUNDBITE) (English) SENATOR KAMALA HARRIS (D-CA), SAYING (JUNE 13, 2017): "Did you have any communications with Russian officials for any reason during the campaign that have not been disclosed in public to this committee.
" (SOUNDBITE) (English) ATTORNEY GENERAL JEFF SESSIONS, SAYING (JUNE 13, 2017): "I don't recall it [FLASH] but I'm not able to be rushed this fast. It makes me nervous." 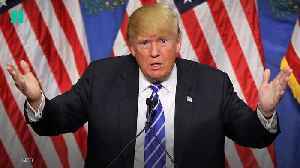 ...and her support for Christine Blasey Ford, who accused Supreme Court candidate Brett Kavanagh of sexual assault. (SOUNDBITE) (English) U.S. SENATOR KAMALA HARRIS, SAYING (SEPT.
27): "You have been a true patriot." She's also emerged as a proponent of digital privacy, an area she first tackled as California's attorney general. She spoke to Reuters in 2013 about protecting consumers. (SOUNDBITE) (English) CALIFORNIA ATTORNEY GENERAL KAMALA HARRIS, SAYING: "Are you downloading my contact list without me knowing about it? Are you, through my GPS, tracking everywhere I go? Because although I might like the benefit of the technology that does that, I don't want you knowing everywhere I go." Last year she took Facebook CEO Mark Zuckerberg to task over a scandal where his firm shared users' data with a political consulting company. (SOUNDBITE) (English) FACEBOOK CEO MARK ZUCKERBERG, SAYING: CALIFORNIA ATTORNEY GENERAL KAMALA HARRIS, SAYING: APRIL 10: Senator, in retrospect, I think we clearly view it as a mistake that we didn't inform people. HARRIS: So there was a decision made on that basis, not to inform the users. ZUCKERBERG: That's my understanding, yes. She has a long history with California's tech firms from her time as AG, and in 2013 said she worked well with the industry. (SOUNDBITE) (English) CALIFORNIA ATTORNEY GENERAL KAMALA HARRIS, SAYING: "It's been, I think, a very rare and wonderful example of industry and government working together to create a solution short of mass litigation and mass regulation." As a candidate she may be able to use that experience to tap the riches of Silicon Valley. But her background as a prosecutor could open her to attacks in the Democratic primary. Her office defended cops and police departments accused of abuse and misconduct. The rise of the Black Lives Matter movement pushed many in the party to demand tougher police oversight. 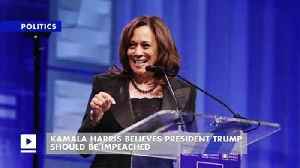 Harris has tied to cast herself as having been a progressive prosecutor. But some may demand she further reckon with her record. (SOUNDBITE) (English) U.S. 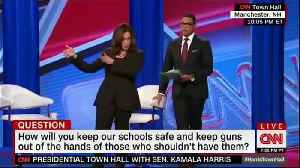 SENATOR KAMALA HARRIS, SAYING (APRIL 5): "And we must hold on to the fact and the knowledge in our hearts, in our guts, we are better than this." Her campaign will have an office in Baltimore, and one in Oakland. 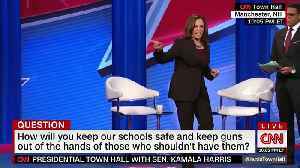 Kamala Harris explains how she would keep schools safe from gun violence. The problem for Democrats is that this desire to just investigate isn&apos;t shared by all congressional Democrats. 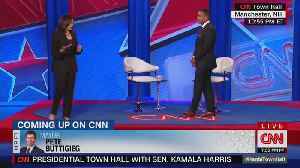 Democrat presidential candidate Sen. Kamala Harris staked out two radical policy positions during a CNN-hosted town hall event Monday evening in New Hampshire. 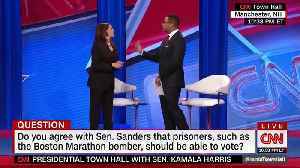 She issued the surprising declaration when asked by moderator Don Lemon to respond to fellow presidential candidate Sen. Bernie Sanders&apos; proposal to let everybody vote, including even the..